US Power Metal band Reverence have released a lyric video for ‘New Order’, which is taken from the band’s latest EP, ‘Foreverence’. ‘New Order’ is the second release from ‘Foreverence’. The first official video off their new EP was for the song ’FireLord’. Foreverence is a follow-up to the band’s last two acclaimed releases, ’God of War’ and ‘When Darkness Calls’. 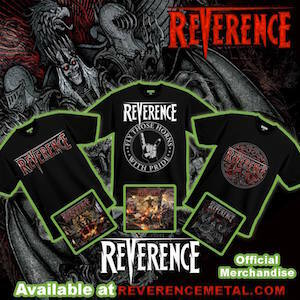 You can purchase ‘Foreverence’ and other Reverence releases at their official website Reverencemetal.com, iTunes, Amazon, Spotify, CdBaby and most other online retailers.